Unipro 25th anniversary | Unipro. Reliability. Quality. Intellect. Unipro 25th anniversary – Unipro. Reliability. Quality. Intellect. Our company steps to the next 25-year period, reviewing the important milestones through its history and clarifying the direction forward. We survived a lot – with the country and Akademgorodok, employees and customers. Sun Microsystems, our first long-term customer, disappeared in 2010 absorbed by Oracle. 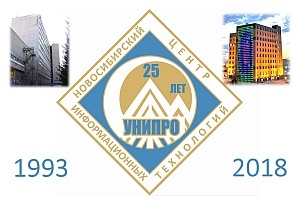 In 2004, thanks to the activity and competencies of Unipro, Intel came to Novosibirsk, opened R&D center, but after 12 years, left away. But we are still on our path. We continue to raise software engineers with unique competencies and carry on serious long-term custom projects in different directions along with open source IT products for global market. Go forward with us!